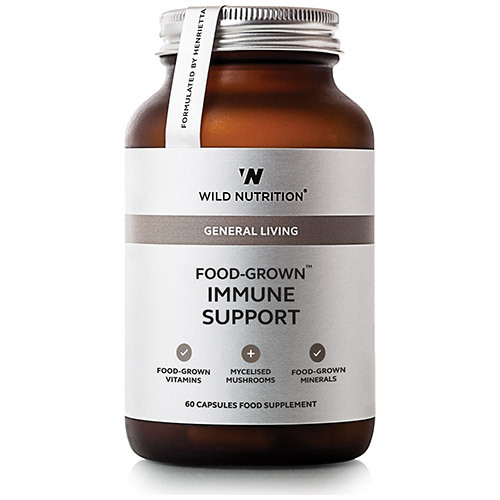 Wild Nutrition`s expertly formulated Food-Grown Immune Support is a powerful blend which supports the normal function of the immune system and also promotes our natural defences against infection. The Food-Grown Immune Support contains a powerful blend of biomass mycelial mushrooms, N-acetyl cysteine, elderberry and Food-Grown vitamins and minerals. This unique product includes the pioneering process of mycellial biomass to produce Wild Nutrition`s mushrooms. This intensifies the immune-supporting properties of beta-glucans, polysaccharides and antioxidants, enzymes super oxide dismutase and glutathione peroxidase naturally found in mushroom complexes. Vitamin C and Bioflavonoids incorporated in Citrus pulp; Mineral enhanced Yeast providing Vitamin D3, Copper and Selenium; Lactobacillus bulgaricus* (from milk) providing Niacin, Zinc and GTF** Chromium; Beta-Carotene incorporated in Carrot concentrate; N-Acetyl Cysteine; Elderberry extract; Maitake Mushroom powder (Mycellised) and Oyster Mushroom powder (Mycellised). Vegetable cellulose (capsule shell). Take 2 capsules per day with or without food. Below are reviews of Wild Nutrition Immune Support - 60 Capsules by bodykind customers. If you have tried this product we'd love to hear what you think so please leave a review.